To commemorate the newly launched LEGO® Star Wars Miniland Death Star Model Display, Legoland Malaysia is organising a special celebration called the LEGO Star Wars Days this weekend. The themed weekend will see various fun filled activities lined up at the Park for fans and families. This includes free entry for children that come dressed up in their favourite Star Wars characters to the Park from 16th – 18th August. “We have seen fans of all ages flocking to Legoland Malaysia to see the largest Lego Star Wars Miniland Death Star Model Display. There is more excitement to come this weekend as the Park becomes alive with the activities. 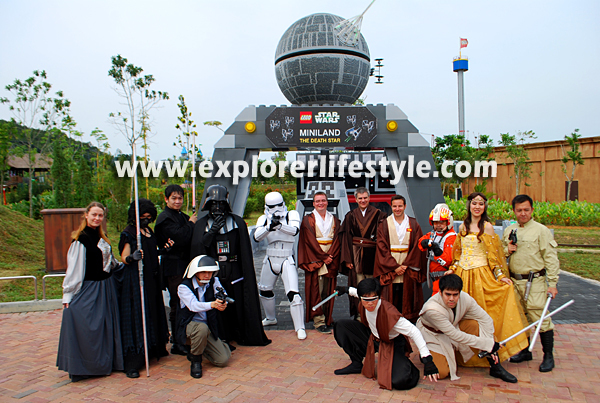 This is the perfect opportunity for fans young and old to join forces on a special LEGO Star Wars adventure,” said Siegfried Boerst, General Manager Legoland Malaysia. Park guests will also be able to enjoy a host of other activities including themed building activities of the R2-D2 Star Wars LEGO model, Star Wars Lightsaber performances, mystery LEGO mural building and movie screenings at the 4D Cinema. Special collectible badges are also up for grabs at the Park during this time and there are four to be collected starting from 16th – 18th August 2013 at Legoland Malaysia.